It’s been a busy few weeks here at ClassAction.org – and you may have a very good idea as to why. We sent out an e-mail last week urging you to write and call your senators and house representatives to stop H.R. 985 – a bill that aims to kill class action lawsuits. We appreciate the support and feedback we’ve received from you guys. On March 9th, the bill passed the House, but the fight isn’t over yet. Get the update here. Well, let’s get back to more of the usual! In this issue, we’ve got reports on exploding pressure cookers, supplements being sold with some deceptive claims, and several industries that are under fire for failing to pay their workers proper overtime wages. We’ve got the settlements as the bottom, as always. So, read on for more! Pressure cookers are increasingly common in our kitchens, and for fans and converts alike, offer one of the easiest ways to get dinner on the table. They’re not without their risks though – and some consumers are finding this out way too late. It is believed that design flaws are causing food inside the cookers to explode out. As you can imagine, it’s a dangerous situation, and last year one manufacturer, Tristar, was hit with a proposed class action over the issue. In that case, the plaintiff was sprayed with steaming soup even after waiting for the pressure cooker’s indicator to tell her it was safe to open the lid. 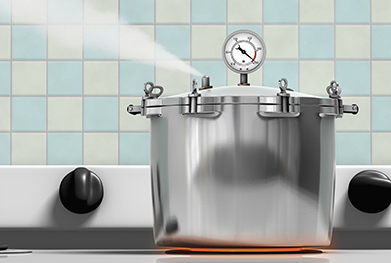 When the boiling food burst out, the plaintiff suffered first- and second-degree burns – and other manufacturers are now facing similar complaints from consumers, many of whom have shared their stories online. Tristar, Maxi-Matic, Cuisinart and others have all been named by consumers as potentially faulty, and attorneys working with ClassAction.org are looking to learn more about the issue. Have you had problems with your pressure cooker? Let us know. Consumers have a right to expect that the products they buy are fairly and clearly labeled. This extends to the claims that products make, whether they’re tools, toys, food, or dietary supplements. There are a lot of pills out there that claim they can help with weight loss and energy, but it’s worth maintaining a healthy dose of skepticism. Case in point: garcinia cambogia supplements, often sold as appetite suppressants and diet aids, have little to no effect on weight loss, according to published research. This is all despite the fact that manufacturers claim that the hydroxycitric acid (HCA) in the supplements will have you shedding inches from your waistline. In one three-month study at the Pennington Biomedical Research Center in Louisiana, no discernible weight loss was noted in a group of people who took garcinia cambogia when compared to a group who didn’t. Now, consumers are saying they’ve been duped – with some even complaining that they’ve gained weight. If you’ve been taking these pills, a class action lawsuit could help you get your money back. For more information and a list of the products we suspect are being sold with false and misleading claims, click here. Attorneys working with ClassAction.org are looking to hear from anyone who’s purchased Costco’s Trunature Milk Thistle, Trunature Premium Milk Thistle or Trunature Liver Health Complex products. Despite the products’ claims regarding liver health, attorneys suspect that the supplements do not, in fact, contain enough of the key ingredient, silymarin, to have any effect. Lab tests have demonstrated that the silymarin levels in Costso’s products are too low, leading some to suspect the company’s claims are therefore misleading. If you’ve purchased any these supplements from Costco, get in touch today to tell us about it and to learn more about how you could help get a class action started. Lawsuits are being filed on behalf of cable installers and repair workers after allegations surfaced that some telecommunications companies are illegally classifying these workers as independent contractors, rather than employees, to avoid paying overtime wages. Anyone who currently works, or used to work, in these positions may be able to take part in a class action lawsuit to recover the money they’re owed. Find out more. Insurance investigators who weren’t paid overtime may be able to seek compensation for their back wages. A number of companies are facing allegations that they’re incorrectly classifying their investigators as exempt from overtime pay – but, as GEICO recently found out, this can get some companies into trouble. Courts are becoming increasingly sympathetic in these cases, and following a 2015 ruling that insurance investigators cannot be classified as exempt from overtime, more lawsuits are expected. Read more. LuLaRoe has been hit with a proposed class action in Pennsylvania over the company’s system of charging sales tax even when the buyer is in a jurisdiction that doesn’t charge tax on clothing. The plaintiff in the case calls this a disguised or “hidden” tax that is illegally added to buyers’ bills – and many are coming to her defense. Thoughts? Share them and read more here. If you haven’t seen our recent blog post, it’s worth reading: a number of banks have started charging “extended” overdraft fees when customers’ accounts remain in overdraft status for a certain length of time. The problem? The National Bank Act makes it illegal to charge unreasonable interest rates, and these new overdraft fees are said to be working out to be way above the legal limit. Bank of America, Chase, and other prominent banks are already seeing lawsuits from consumers who’ve been hit with the new charge. Read more. Bayer is facing a lawsuit in California over the number of days’ worth of vitamins in its “One-a-Day” VitaCraves multi-vitamins. According to the complaint, the company packages its vitamins with only half the amount needed to match its marketing materials – meaning that rather than one a day, you’d have to take two of the vitamins just to get the recommended dose. Read more. A jury in New York has been told by plaintiffs that Johnson & Johnson knew about the cancer risk of its talcum powder, but chose to ignore the warnings because of its “love of money.” The company has already been slammed with verdicts totaling more than $200 million in cases alleging a link between ovarian cancer and talcum powder products. Johnson & Johnson maintains, however, that studies used to establish the link have been exaggerated and argues that no official scientific agency is yet convinced of the dangers. Is there any real aloe out there? It’s seemingly less and less likely. We’ve added seven new gels to our investigation into whether these products actually contain any aloe. (Independent lab tests show it’s not looking good.) Products added to the investigation are as follows: Walmart’s Equate Cooling Aloe Sunburn Relief Gel and Soothing Aloe After Sun Gel, Ocean Potion’s Aloe Gel, Hawaiian Tropic’s After Sun Cooling Gel, Banana Boat’s Aloe Gel, Publix’s Relieving After Sun Gel and Rocky Mountain’s Sunburn Relief Gel. Read more here.